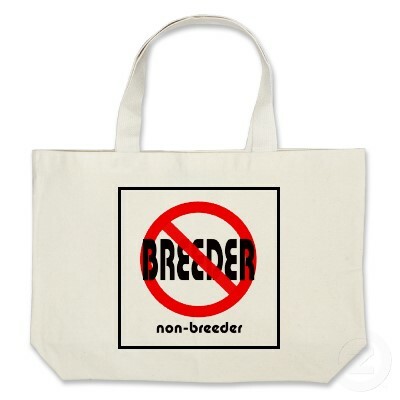 One of most common Breeder Bingos is, “You’ll regret being childfree when you’re older.” To which most of us roll our eyes or nod agreeably but dismissively. Do not encourage this condescending know-it-all. Do not suggest that s/he will regret having children when s/he is older. Do not explain my childfree choice because his/her judgment is made. Despite frequent suggestions that the childfree choice will inevitably morph into childfree regrets, most of us learn to avoid engaging. We become tired with countering judgment with reason and dialogue. Parent conviction is deeply ingrained and generally inflexible. Trying to be understood (or, god forbid, respected) by parents who inflexibly assume that we will experience childfree regret down the road is akin to the dysfunctional dialogue between theists and atheists/agnostics. Patience, passion, logic, science, conviction, etc. need not apply. So reading “What I Regret About Being Childfree” offered a welcome antidote. This admittedly snarky post written by Julie Was Here (aka The hiking Humanist) originally emerged from a response to a childfree-basher. So this list was originally written as a response to a rather persistent troll on another website, who tried to insist that the childfree (namely, me) are envious of her life as a grandmother (by her own admission, breeding is about all she ever did with her life,) and secretly regret being childfree. Her childfree regrets range from spot-on to hilarious, and the list is virtually endless. I’ve culled my favorites into a top ten parade to entice you to wander over and read the full post. Please note that the following is excerpted and quoted directly from Julie Was Here‘s post. What are Your Top “Childfree Regrets”?